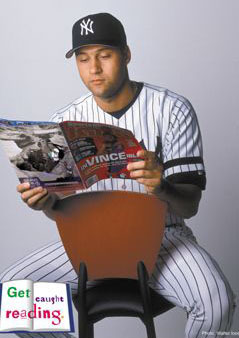 This still goes on, though I don’t remember ever seeing a poster since this Derek Jeter one from early on. Get Caught Reading’s website describes itself as “a nationwide campaign to remind people of all ages how much fun it is to read. Launched in 1999 and supported by the Association of American Publishers, GCR encourages you to order our free posters, read our newsletters, download our free videos, and join the thousands of celebrities, booksellers, teachers and librarians who continue to embrace this campaign across the country.” Probably I’m guilty of not spending enough time in libraries. Now I discover that the English Premier League is also helping promote reading, and has been for 11 years. 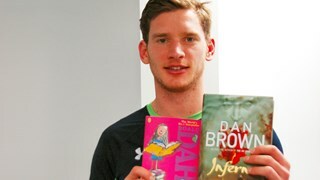 The National Literacy Trust’s website has a video of Jan Vertongen (Belgian defender for Tottenham Hotspur – Come on you Spurs!) telling us about his favorite reading. For those of you unfortunate enough to support other football teams (soccer teams to you Americans) there’s listing down the left hand side of the page of other literate hoofers.